This article is about the Archbishop of Seville. For the Spanish peasant and patron saint of Madrid, see Isidore the Laborer. At a time of disintegration of classical culture, and aristocratic violence and illiteracy, he was involved in the conversion of the Arian Visigothic kings to Catholicism, both assisting his brother Leander of Seville, and continuing after his brother's death. He was influential in the inner circle of Sisebut, Visigothic king of Hispania. Like Leander, he played a prominent role in the Councils of Toledo and Seville. The Visigothic legislation that resulted from these councils influenced the beginnings of representative government. An elder brother, Saint Leander of Seville, immediately preceded Saint Isidore as Archbishop of Seville and, while in office, opposed king Liuvigild. A younger brother, Saint Fulgentius of Cartagena, served as the Bishop of Astigi at the start of the new reign of the Catholic King Reccared. His sister, Saint Florentina, served God as a nun and allegedly ruled over forty convents and one thousand consecrated religious. This claim seems unlikely, however, given the few functioning monastic institutions in Iberia during her lifetime. Isidore received his elementary education in the Cathedral school of Seville. In this institution, the first of its kind in Iberia, a body of learned men including Archbishop Saint Leander of Seville taught the trivium and quadrivium, the classic liberal arts. Saint Isidore applied himself to study diligently enough that he quickly mastered Latin, and acquired some Greek, and Hebrew. Two centuries of Gothic control of Iberia incrementally suppressed the ancient institutions, classic learning, and manners of the Roman Empire. The associated culture entered a period of long-term decline. The ruling Visigoths nevertheless showed some respect for the outward trappings of Roman culture. Arianism meanwhile took deep root among the Visigoths as the form of Christianity that they received. After the death of Saint Leander of Seville on 13 March 600 or 601, Isidore succeeded to the See of Seville. On his elevation to the episcopate, he immediately constituted himself as protector of monks. Based on a few surviving canons found in the Pseudo-Isidorian Decretals, Saint Isidore is known to have presided over an additional provincial council around 624. Through Isidore's influence, this Council of Toledo promulgated a decree, commanding all bishops to establish seminaries in their cathedral cities along the lines of the cathedral school at Seville, which had educated Saint Isidore decades earlier. The decree prescribed the study of Greek, Hebrew, and the liberal arts and encouraged interest in law and medicine. The authority of the Council made this education policy obligatory upon all bishops of the Kingdom of the Visigoths. The council granted remarkable position and deference to the king of the Visigoths. The independent Church bound itself in allegiance to the acknowledged king; it said nothing of allegiance to the Bishop of Rome. In it, as Isidore entered his own terse digest of Roman handbooks, miscellanies and compendia, he continued the trend towards abridgements and summaries that had characterised Roman learning in Late Antiquity. In the process, many fragments of classical learning are preserved which otherwise would have been hopelessly lost; "in fact, in the majority of his works, including the Origines, he contributes little more than the mortar which connects excerpts from other authors, as if he was aware of his deficiencies and had more confidence in the stilus maiorum than his own" his translator Katherine Nell MacFarlane remarks. The fame of this work imparted a new impetus to encyclopedic writing, which bore abundant fruit in the subsequent centuries of the Middle Ages. It was the most popular compendium in medieval libraries. It was printed in at least ten editions between 1470 and 1530, showing Isidore's continued popularity in the Renaissance. Until the 12th century brought translations from Arabic sources, Isidore transmitted what western Europeans remembered of the works of Aristotle and other Greeks, although he understood only a limited amount of Greek. The Etymologiae was much copied, particularly into medieval bestiaries. He contributed two decisions to the Fourth Council of Toledo: Canon 60 calling for the forced removal of children from parents practicing Crypto-Judaism and their education by Christians and Canon 65 forbidding Jews and Christians of Jewish origin from holding public office. Historia de regibus Gothorum, Vandalorum et Suevorum, a history of the Gothic, Vandal and Suebi kings. The longer edition, issued in 624, includes the Laus Spaniae and the Laus Gothorum. Isidore was one of the last of the ancient Christian philosophers and was contemporary with Maximus the Confessor. Some consider him to be the most learned man of his age, and he exercised a far-reaching and immeasurable influence on the educational life of the Middle Ages. His contemporary and friend, Braulio of Zaragoza, regarded him as a man raised up by God to save the Iberian peoples from the tidal wave of barbarism that threatened to inundate the ancient civilization of Hispania. The Eighth Council of Toledo (653) recorded its admiration of his character in these glowing terms: "The extraordinary doctor, the latest ornament of the Catholic Church, the most learned man of the latter ages, always to be named with reverence, Isidore". This tribute was endorsed by the Fifteenth Council of Toledo, held in 688 and later in 1598 by Pope Clement VIII. Isidore was declared a Doctor of the Church in 1722 by Pope Innocent XIII. Isidore was interred in Seville. His tomb represented an important place of veneration for the Mozarabs during the centuries after the Arab conquest of Visigothic Hispania. In the middle of the 11th century, with the division of Al Andalus into taifas and the strengthening of the Christian holdings in the Iberian peninsula, Ferdinand I of León and Castile found himself in a position to extract tribute from the fractured Arab states. In addition to money, Abbad II al-Mu'tadid, the Abbasid ruler of Seville (1042–1069), agreed to turn over St. Isidore's remains to Ferdinand I. A Catholic poet described al-Mutatid placing a brocaded cover over Isidore's sarcophagus, and remarked, "Now you are leaving here, revered Isidore. You know well how much your fame was mine!" Ferdinand had Isidore's remains reinterred in the then-recently constructed Basilica of San Isidoro in León. Today, many of his bones are buried in the cathedral of Murcia, Spain. In Dante's Paradiso (X.130), Isidore is mentioned among theologians and Doctors of the Church alongside the Scot Richard of St. Victor and the Englishman Bede the Venerable. The University of Dayton has named their implementation of the Sakai Project in honour of Saint Isidore. His likeness, along with that of Leander of Sevile and Ferdinand III of Castile, are depicted on the crest badge of Sevilla FC. The Order of St. Isidore of Seville is a chivalric order formed on January 1, 2000. An international organisation, the order aims to honour Saint Isidore as patron saint of the Internet, alongside promoting Christian chivalry online. Members, who may be men or women, receive a modern-day knighthood. ^ Braulio, Elogium of Isidore appended to Isidore's De viris illustribus, heavily indebted itself to Jerome. ^ Cohen, Jeremy (1999). Living Letters of the Law. Berkeley: University of California Press. p. 97. ISBN 978-0-520-21870-3 – via books.google.com. ^ The Order of St. Isidore of Seville. Accessed 28 June 2014. Barney, Stephen A., Lewis, W.J., Beach, J.A. and Berghof, Oliver (translators). The Etymologies of Isidore of Seville. Cambridge: Cambridge University Press, 2006. ISBN 0-521-83749-9, 978-0-521-83749-1. Castro Caridad, Eva and Peña Fernández, Francisco (translators). "Isidoro de Sevilla. Sobre la fe católica contra los judíos". Sevilla: Universidad de Sevilla, 2012. ISBN 978-84-472-1432-7. Online Galleries, History of Science Collections, University of Oklahoma Libraries High resolution images of works by Isidore of Seville in .jpg and .tiff format. De natura rerum (Msc.Nat.1) (On the Nature of Things) digitized by the Staatsbibliothek Bamberg. "Isidorus, archbp. of Seville" . Dictionary of Christian Biography and Literature to the End of the Sixth Century (3rd ed.). 1911. "Isidore of Seville" . Encyclopædia Britannica. 14 (11th ed.). 1911. pp. 871–872. O'Connor, J.B. (1910). 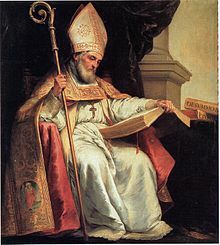 "St. Isidore of Seville" . Catholic Encyclopedia. 8.